I'm on my second RCZ and had that fault with the first one alas out of warranty so had to buy one . The price was £114 52 in 13/12/2013 and decided to fit it my self. You have to remove the boot lid liner , which is held on with plastic push in buttons and can be removed with a flat blade screwdriver . The brake light unit is held on by two 10mm nuts undo these and unplug the light unit job done it's that easy . Just bought my first RCZ Grey THP 200 GT 2011 12000 miles on clock. Air compressor shot need new Pug reducing cost of replacement by 75% and now noticed 1 light out in light below spoiler. Can you buy a replacement and fit self as its easy to replace as stated by others. Hello and welcome to the forum. You can indeed purchase a replacement and fit it yourself and if you read this very thread you can find the part number and price but it's quite an expensive item I'm afraid. Looks like I'll be using this forum quite often as there seem to be a lot of gremlins with this car. 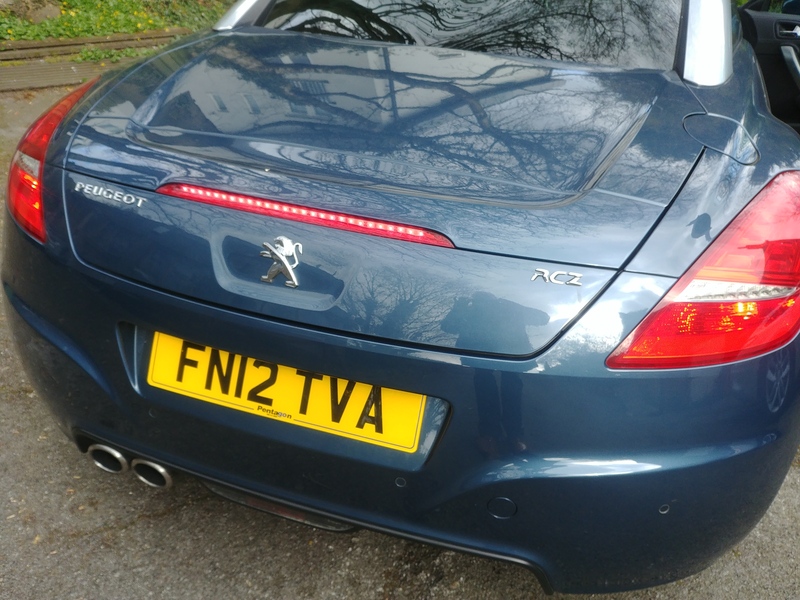 Shame Peugeot don't own up to obvious problems and agree fixes as its a beaut to look at and drive. Now got air con, time to play face a bit for the rear brake light cluster to see what they'll do. My rear brake light LED's were missing a few dud bulbs but my dealer told me if my car was in warranty then he would be pledging to have it replaced under warranty. Is your car still in warranty? GSF Car Parts have these Led lights in stock. They are genuine but offer a modest saving over the dealer price. Renegade - there are two GSF branches in Dublin. Also many branches in England, Wales, Scotland and N.Ireland. Does anyone know where can I find a replacement, please? It can be used, I don't mind. The price at the dealership in Cambridge is out of reality. 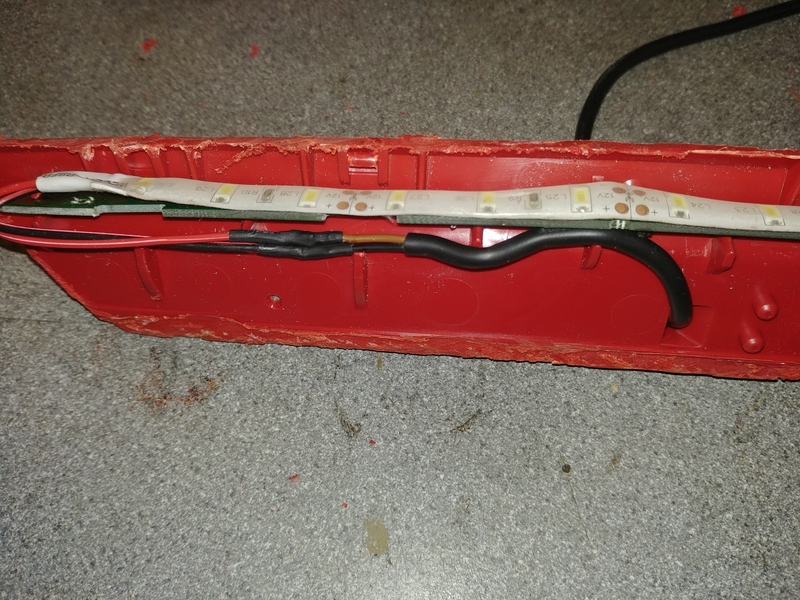 If you get a replacement, find someone who is good with electrics/electronics and see how much to replace the damaged leds as you can then recoup some of the cost by selling, or alternatively you can sell the one after replacement and let the next person repair it. Ive been looking for a second hand unit to have a go at repairing but people are wanting ridiculous prices even for faulty units. LEDs are easily available the problem will be splitting the original unit to get inside then resealing but I reckon it’s doable. If anyone has a dud unit they’ve replaced and they want shut drop me a pm. Dragging this thread back out again! The lights on our RCZ had completely failed, after some random flashing and multiple LEDs out. SO, first off, it's not just a couple of Torqs to get the thing out, take out all the clips in the tailgate trim, then there are 2 torq screws in the handle wells. Drop the panel down and the light unit is held with 2 10mm nuts (the others are on metal, these are on plastic so you can tell which two) - there are 2 utter b4st4rd spring clips under the boot lock mechanism mount, I gently prised the light while manipulating the clips with a screwdriver to get the out. Now the fun part, that light is NOT intended to be taken apart!!! Enter the dremel, I had to cut the entire perimeter, and not too close to the edge either as the glue is quite deep, took a little while but it's not pretty!! I wound up with a slight crack at one end of the lens but it's under the spoiler so not visible, just don't try to pry too much. Once in there the board is pretty simple, but a pig to get near, no sign of obvious dry joints etc so I think it's actually the surface mount components that have failed (rather than just the LEDs). Hence I got a stanley and just chopped all the LEDs off to leave a smooth panel and bonded on some kitchen style LED strip to it. Soldered to the existing cable and then hot melt glued the panel in and glued the unit back together (after cleaning up the edges). I also had to remove the reflector which is a shame, but the alignment was no where near. The end result will do for now, to be fair I'm almost reluctant to buy a proper one in case that goes, I've got a roll of these strip LEDs for about a tenner, could fix about 10 if it weren't such a sod to get into! I've had a look at the reflector now, and the holes are 6mm. Chuck the PCB completely, and glue the LEDs into the existing holes. Then bend the pins over (perhaps round a small screwdriver to curve them, and then just solder them all together. 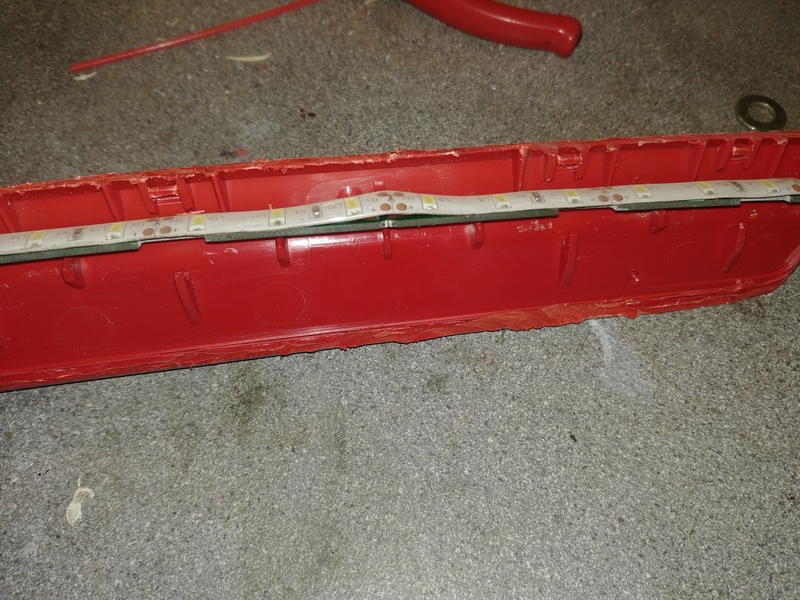 These are 12v native LEDS so no resistors needed, and with them all fastened to each other it would make a solid 'rail' that couldn't short out.